It is a great joy to welcome you to our UT Martin Athletic Bands home page! Our program offers two regularly performing groups throughout the academic year: The Aviators (August – November) and The Basketball Band (October – March). Comprised of students of various majors from across the campus, each group prides itself on high-quality, energetic music and a fun-loving atmosphere in the stands. Both of these groups prove to be an integral part of home sporting events and are essential to the game day atmosphere developed throughout campus. Beyond the home stands, the bands regularly engage our community through parades and other service oriented performances. It is not uncommon to see the one of the bands out performing at an area school promoting our fine university. Additionally, in February of 2017, the Basketball Band was the first every band to be invited to perform for Tennessee’s Day on the Hill in Nashville. Click on the Information Tab to read more about each ensemble, our scholarship opportunities, and general questions regarding UT Martin Athletic Bands. From our musical family to yours, I thank you for visiting our page and hope that you will consider joining our team. 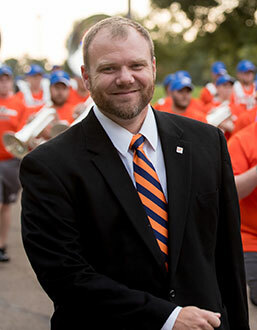 If you have questions about auditioning for Athletic Bands, please contact Dr. Bill Waterman at wwaterma@utm.edu. The Aviators is our newly named ensemble leading the new direction of UT Martin Fall Athletic Bands. Designed with a less intensive approach to competitive marching band (rehearsing once a week) the group regularly performs at home football games at Hardy Graham Stadium, local parades, and select exhibitions throughout the Fall Semester. Performing spots are available for piccolo, flute, clarinet, saxophone, trumpet, mellophone, trombone, baritone, sousaphone, and battery percussion (snare, tenors, bass drum, cymbals). Scholarships are available to all registered performing members. The Aviators ensemble is open to musicians of all levels and anyone with prior experience will not be turned away. We use Google Calendar. Please click on the tab to the left “UTM Bands Calendar” to view upcoming performances for both Athletic Bands and Concert Ensembles. The Aviators typically perform for all home football games, but NOT away games. Additionally, the band performs 2-3 local parades throughout the fall semester. On occasion, they will perform in exhibition at other regional contests or on other special music outings in the West Tennessee/Regional Area. Basketball Band typically only performs at home games during the academic year and at the OVC Tournament. If the team qualifies we travel to the NCAA tournament as well. If you are interested in joining the Aviators please fill out our Interest Form . Drumset players will be asked to demonstrate competency of multiple styles: rock, swing, funk, samba, etc. The Aviators: A modest scholarship is available for all registered performing members of the ensemble. Members should register for the class and fulfill the class requirements in order to receive their scholarship. Colorguard spots are available with the Aviators ensemble. Members are available to perform in parades and other select opportunities. Those with previous experience in colorguard will have an opportunity within the ensemble. Those interested in playing percussion within the Aviators ensemble will play standard battery instruments. One should plan to attend band camp as our drumline is set on the first day of band camp. Percussionists with interest in joining the Basketball Band will need to demonstrate proficiency on drumset. UT Martin has a select number of instruments for rent of which are available on a first come first serve basis for our members. Those in need of an instrument should plan on checking one out during their registration at Band Camp in the Fall. Music may be available for download prior to being on campus. Please click below for access to Pre-Game and Halftime music for the upcoming season. A Username and Password are required for entrance. Athletic Bands and our Concert Ensembles run concurrently through the fall and spring semesters. Below outlines our course offerings for those interested in the Aviators ensemble and/or the Basketball Band. MUS 391 Athletic Band: The Aviators! This class is open to all musicians with prior experience performing music. No audition required, but registration is mandatory.